Bestselling author Justin Brown sets out to discover whether modern New Zealand is the same place he was promised when growing up in the 1970s – the land of rugby, racing and beer, 80 million sheep and number 8 fencing wire. Brown performs a 21st century reality check, seeking to learn whether the land of his birth is still the best place to bring up kids and what the future might hold for its citizens. Having turned 36½ and discovered by chance that’s the age of the ‘average’ New Zealander, Brown figured it was time he rediscovered his country. He challenged national sacred cows. Did the ‘good keen bloke’ still exist in New Zealand? Can you still be a real man and use moisturiser? Were the summers of yesteryear really that much warmer than today? Brown’s findings reveal a side to the nation you might not have expected. His light-hearted approach will make you smile as he tracks down Kiwis with the answers. 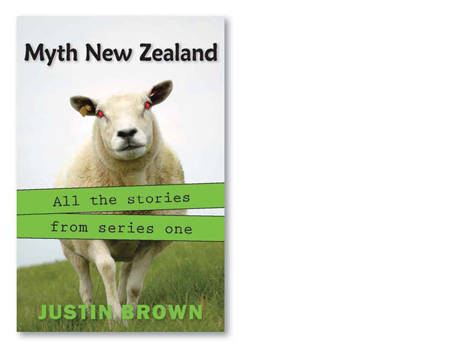 This compilation brings together all the stories in Brown’s series of Myth New Zealand stories, plus a couple of chapters exclusive to this volume. Books in the Myth New Zealand collection are Some of My Best Mates are Metrosexuals; Whatever Happened to 80 Million Sheep? ; The Greatest Place to Bring Up Kids? ; Whatever Happened to Our National Dish?